Darcy Tucker jumps really high. Sean Avery beats him down. The sideshow antics of Toronto's Maple Leafs agitator Darcy Tucker & our very own New York Ranger's Sean Avery weren't enough to take the evening away from our 'now legitimate' backup goalkeeper Stephen Valiquette. In his first game of the season against Toronto last night, after sixteen games of sitting on the bench - he defensively handed the NY Rangers their first win on the road leaving the Blueshirts with an amazing 9-7-1. The Rangers have won six of their last seven games. The offense was controlled by Sean Avery, who assisted Brendan Shanahan on the first goal in the second period, shortly after flipping roles as Shanny assisted Avery for the second goal of the evening. During the third period, all went 'to hell in a hand basket' as Alexei Ponikarovsky scored twice on Valiquette, tying the game which ultimately led to a scoreless overtime and eventual shootout. The decisive shootout goal is credited to Marcel Hossa - which 'made up' for a terrible turnover in overtime (what is it with this guy?). Go here for the official recap. The team is getting the 'moxy' with an unexpected mix of rookies and veterans playing on all three lines in different configurations. 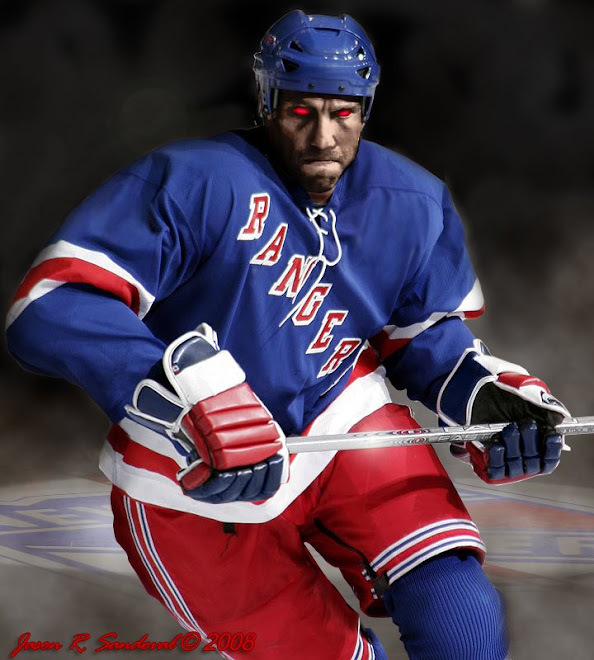 The offense is regenerating and it appears that over the last two or three games The Rangers have rotated that lone offensive player into the opponent's net....waiting. Terrific to see Hockey For Dummies is at work on the Renney staff! Look forward to some time off from BlueshirtLand as the boys have three days until they meet our adversaries across the Hudson River, the New Jersey Devils of Newark at the newly opened and lowly-attended Prudential Center on Wednesday evening, 7pm EST. Henrik The Benched, who awards his fellow-best-playing teammates with a bottle of wine after every game tomorrow will surely be sending a case to his 'mini-me' - the 'Valley Boy' himself, Stephen Valiquette. Cheers! 2) The slkow start will soon be a blip on the screen if this continues. scotty...amen. montoya in the wings as well. woh.